Clinger tells a story about an obsessive young man who, after losing his life in embarrassing fashion, comes back to haunt his girlfriend by insisting that the two were destined to be together forever. And ever. Intended to be a fresh entry into the rapidly expanding subgenre of horror-comedy, the film is decidedly more of a comedy tinged with horror elements, featuring absurd performances, brutally silly killings and psychotic teddy bears. It takes place around a fictional high school for which our heroine, Fern Peterson (Jennifer LaPorte), runs track and is hoping to get into MIT on a scholarship based on a combination of her athletic ability and impressive academics. She’s driven and has a bright future ahead of her . . . at least she did until she met Robert Klingher (Vincent Martella). The pair’s meet-cute at the track, where Fern is attempting to shave seconds off her lap time and Robert’s playing an acoustic guitar alone in the bleachers (for reasons unknown), stems from Robert’s concern for Fern’s health after she plows headlong into a hurdle having been distracted by his John Mayer impression. It’s an odd encounter, though nothing ostentatious. Nothing compared to where Clinger decides to go a few short minutes later. The film stumbles through the relationship-building, transforming a friendship into a romance over the course of a couple of scenes, but that’s not entirely the film’s fault. You see, something’s wrong with Robert. He likes rushing into things, obsessing over making every single moment perfect. He’s the kind to celebrate the one month, three-week anniversary. It would be a sort of sweet sentiment if it weren’t a quality that extends to his undead . . . self. After he gets killed in an entirely underwhelming scene that’s intended to be funny but just . . . isn’t . . . he begins stalking Fern from beyond the grave. He visits her often, wanting to remain by her side. When she makes it clear she’s trying her best to move on with her life, things go from weird to downright bizarre, with Robert determined to do whatever’s necessary to make Fern his eternal lover. As well as marking a major tonal shift, this point is, somewhat unfortunately, where the film falls apart, collapsing under the weight of significantly amateurish writing, acting and essentially every major facet of the filmmaking process. There are some interesting ideas at play — the juxtaposition of the living and the dead create some amusing and at times moving scenarios (what happens when the only person who can ‘see’ Robert insists that the two should stop seeing one another?) — but in terms of execution, this seems closer to a first draft than a finished product. What starts off as a fairly shaky but still inviting teen-centric narrative descends alarmingly quickly into a mess of uncoordinated, juvenile and quite frankly dumb antics, most of which aim to appease the 13-year-old in all of us but instead inspire face-palms. The acting is perhaps the most grating of all, particularly when it comes to Martella’s sweet/creepy serenades to his still-living lover. Clinger takes a pretty cynical approach in examining young love and its obsessive tendencies, and for that it should be praised. It’s refreshing. By shoving the world of the undead and the world of the living together, Michael Steves and company hope that some elements of this bizarre pseudo-zombie comedy (zombedy?) end up sticking. It’s obviously not an exact science and this slapdash film is unfortunately proof of that. 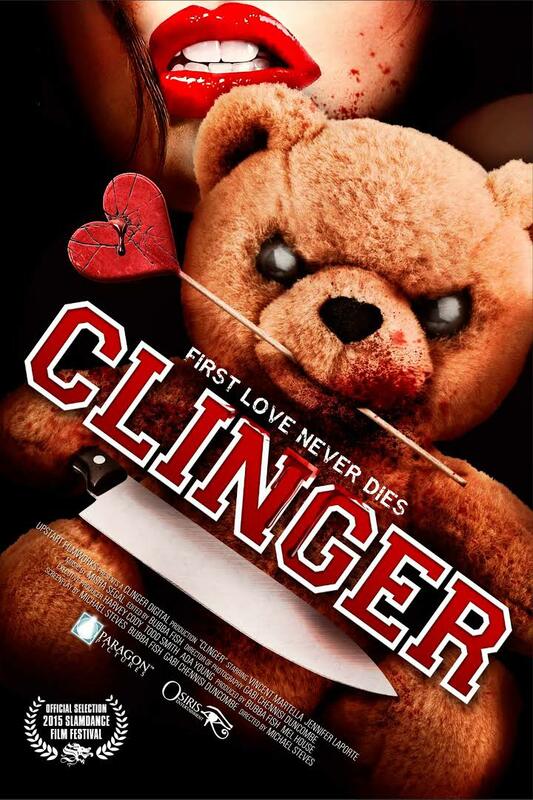 Clinger is in Cinemas and On Demand from today (October 23)! Will you be watching it? Let us know in the comment box below! Must admit that Robert Klingher name made me chuckle. Ebert said funny names were never funny, except when Groucho Marx or W.C. Fields used them, but as often happens I don’t agree. You know from the sounds of it, this film has almost the exact same plot as Nina Forever which is also a horror-comedy, but goes for soulful & sad rather than whatever this is. ← Exclusive Interview: Tom Woodruff, Jr. talks Fire City: End of Days!